Sunny (AKA "the friend") with someone famous that I don't recognize. I think it's someone from American Idol. After having a conversation with a Chinese friend that has recently moved to the US to work on her MBA, we've come to deeper understanding of the culture we love so much. By seeing things through her eyes, it helps us to understand our culture which in turn helps us to understand the Chinese culture a bit more. We are often asked about the differences between education in the US and in China. There are many differences, but what our friend noticed is that the US system is a reverse of the Chinese system. In China, students study and work really hard from the get-go and as time goes on, the schooling gets easier. She said that you have to work extremely hard to get into a school--wether it be a middle school, high school, or university--but once you get in, it's pretty easy to graduate. In the US, it starts out easy and gradually gets more and more difficult. It's easy to get into a school (unless you're talking ivy leagues) but you do have to work to graduate. It's an interesting observation that parallels the Chinese mindset of work hard now so that when you are old, you can enjoy life. On the other hand, we Americans tell our kids to enjoy life while they are young and to balance work and play. Another thing that she mentioned is that the teachers in the US are not responsible. Now, before you get all huffy about this, let me explain where she is coming from. In China, the teachers lecture. They tell you what you need to know, and then basically say, "I've told you, so now you know it" (or have memorized it). They rarely give a chance for students to ask questions. In the US, as our friend noticed, the teachers will ask if there are any questions, and if not, they assume you understand the material and move on. In other words, they place the responsibility on the students (that's why she said the teachers aren't responsible). This, I think, illustrates the difference between the Chinese way of teaching dependence, versus the US way of teaching independence. Not better, not worse…just different, and we love it! 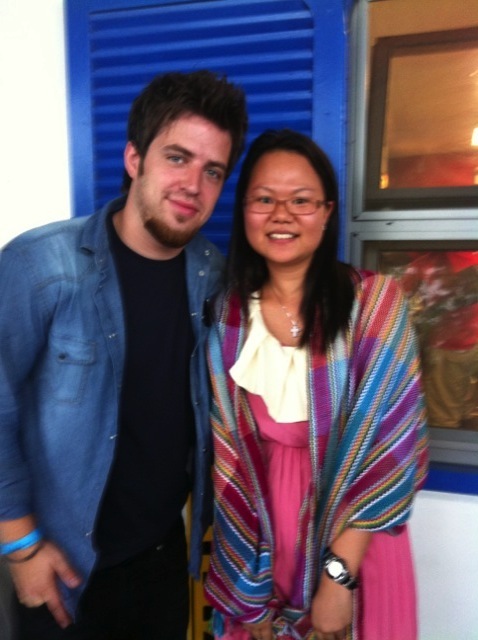 Then we talked about food differences…Suddenly, she understands why we like to eat out so much in China. She said that restaurant food in the US is so expensive and is not as good as what you can cook at home (she must be talking about the cafeteria). In China, it's relatively inexpensive to go out for dinner, and the food is so much better than at home. She also understands why we don't like to eat fish in China. It's not that it's bad--actually, it's quite tasty most of the time. It's just that in the US, the bones are taken out for us so we don't know how to eat around the all tiny bones. Finally, she understands why we get so tired after spend an entire day in a Chinese (language) setting. It's exhausting operating in a second language! And that's why we ask our friends not to call or text after 9pm. The highlight of the whole conversation…wait for it…wait for it…she's learning American Sign Language! That's so awesome! She spent quite a bit of time with us volunteering at a local deaf school here in China, and is now doing the same in the US. Imagine that--a Chinese girl using English sign language. Probably just about as strange as some Americans using Chinese sign. It's so interesting to see American culture through the eyes of a visitor! I can't wait till Christmas when she'll be visiting Josh's family. It'll be exciting to get her insights on that experience! Mundane to exciting all in 20 minutes!